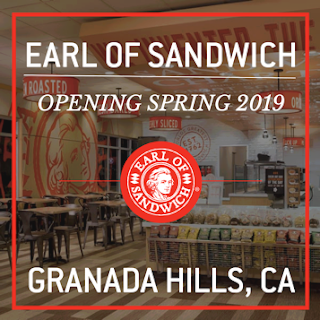 Granada Hills, CA, December 19, 2018 /Prexly/ — Westoasters, Inc., a Los Angeles-basedrestaurant group, has announced that they will be opening Earl of Sandwichrestaurants throughout the San Fernando Valley. Its inaugural restaurant willbe located in The GH Plaza at 18080 Chatsworth Street #2B, Granada Hills, CA91344 and is slated to open in early Spring 2019. Ranked #2 in the U.S. for Tripadvisor's 2018 Travelers' Choice Awards in Fast Casual Restaurants, Earl of Sandwich LLC is a franchise featuring made to order hot sandwiches, fresh salads, wraps, soups, and an array of sides and dessert items. The sandwich chain was founded by Robert Earl, the founder and CEO of Planet Hollywood, and John Montagu, the 11th Earl of Sandwich, a direct descendant of the 18th century British noble who invented the sandwich in 1762. "We felt that Granada Hills would be a great location to put down roots in the San Fernando Valley because of its proximity to Granada Hills Charter High School and Cal State University, Northridge," says operating partner Stephany Bencharit. "Earl of Sandwich's popularity from its locations in Las Vegas and Disney parks is why we are so excited to share this concept with such a vibrant community." For more information regarding the grand opening of Earl of Sandwich in Granada Hills and future locations, you can follow Earl of Sandwich restaurants on Instagram and Twitter (@earlofsandwichsfv), and on Facebook (@earlofsandwichGH). Reporterz.Online is an affiliate platform of Prexly Press Release Distribution Services. Visit Our Network page to see the press release distribution network of Prexly, or click "Submit Press Release" to get a press release published on 30+ websites.